The Last Pope (according to prophecy) compared invading Moslem immigrants the Left claims to be refugees to Mary and Joseph seeking shelter in Bethlehem – except that Mary and Joseph were neither immigrants nor refugees. Does the so-called “Vicar of Christ” not know biblical history? How does he compare people, who steal across the border of the United States to take jobs and taxpayer benefits, and Moslems who are invading Europe because their own Muslim Brotherhood started wars to overthrow their governments, to Mary and Joseph travelling to Bethlehem for the Roman Census? WTF is wrong with this Pope’s brain? Mary and Joseph seeking a place to stay in Bethlehem are akin to people looking for a hotel room in a city having a convention. Seeking refuge for the night is not the same as being a refugee. Liberals just get confused by words. Refugees and immigrants are entirely different people. Refugees are fleeing disasters and oppression. Immigrants are simply moving to another place to live. But there is a vast difference between those fleeing disaster and oppression and those fleeing from a war of their own making. And there is an equally vast gulf between those who immigrate to another country to live with them and those who steal across their border to live among them while partaking of their wealth without paying taxes for the privilege. Mexicans and Moslems are not coming to America to become part of the American culture, but to steal from the American people and/or force them to convert to their culture. La Raza does not want to become Americans, but to take back what Mexico lost in its war with America two lifetimes ago. It is one thing to want to escape from the oppressive government of Mexico and live the American Dream, but like blue state Democrats who move to red states to escape their high taxes they don’t do so to become responsible, hard-working individuals prospering from their labors. Instead they become part of the problem in America and contribute to the Democrat voter base (illegally) to elect Democrats whose high taxes they fled, to take more from hard-working taxpayers and give benefits (i.e. scraps from the Democrat table) to themselves. Those who do want to become Americans are welcome, but those who only want to sponge off of the taxpayers, who want to be the takers stealing from the makers, are not. Marxism, the ideology of deadbeats and thieves stealing from hardworking producers has produced more poverty in the world than any despot. Their credo of, “From each according to his ability to each according to his need,” encourages sloth, envy, and greed. And what of Moslems coming to America, who do not want to live among Christians, but who would force the infidels to submit to Sharia Law and convert to the anti-Christian beliefs of Islam? Atheists see any worship of any god as fantasy, so they are easily confused by Judaism, Christianity, and Islam as all having descended from Abraham and therefore all worshipping the same God, but they do not. Islam rejects the God of Isaac in favor of the god of Ishmael. (If you don’t know who these men are then you are sorely lacking knowledge of biblical history.) They curse Jews and especially Christians as infidels declaring that Isaac was false and that God had no Son. Instead, they perpetrate violence on those who refuse to submit to Islam declaring Allahu Akbar, “Allah is the greater god,” as they kill and oppress the infidels. How in the name of Jesus the Christ and God Almighty does this Pope, who is supposed to speak for Jesus and be the righteous voice of God on Earth, compare these people to Mary and Joseph? They did not go to Bethlehem to force their beliefs on others or to kill anyone. This Pope is so lost that he may very well bring about the prophecy that the line of Popes will end with him. There is no excuse for this Pope, or the Catholic Church that elected him, to promote anti-Christian leftist ideological beliefs. Telling Christians to accept Islamists into their fold is like asking Nazis into your home. Inviting Islamists into church to worship Allah is worse! Jesus did not say to invite Satan into the God’s House. That’s not how you make friends, but how you commit suicide and sacrifice your children. Barack Hussein Obama told America he was a Christian. Yet he took his father’s Muslim name, adopted his father’s Moslem socialist ideology, and openly declared that he would stand with Moslems against Christians if the conflict between the two escalated. Pope Francis says he is a Christian as the leader of the Catholic Church. Yet he declares himself to be a scholar of the Koran believing it only teaches peace, and he endorses Moslems colonizing the West declaring that Europe and America. The result is no-go zones where Moslems rule city streets, commit gang rapes en masse of western women who go out without male escorts because their and Sharia allow it, and are successfully multiplying terror attacks by jihadis in their midst. As all leftists who lack a moral compass and education Pope Francis is confusing being a Useful Idiot with being a Good Samaritan. That’s not righteous leadership. It’s either being a foolish sucker used by the wicked for their evil ends, a snake in the grass, or a wolf in sheep’s clothing. Did I really just say this about the Pope? You bet I did! This entry was posted in Islamism, Politics, Religion and tagged Anti-Christian, Christianity, ISIS, Islam, Islamo-Nazis, Islamophobia, Jihad, Moslem refugees, Pope Francis. Bookmark the permalink. Pope Francis is a symptom of what ails the Catholic Church. It has been on the decline for quite some time, at least three generations, with all the pedophilia hidden until now – and the exposure isn’t because the Pope is pious; exposed for the same reason that Hollywood was exposed and now Congress. As a practicing Catholic, I need to take issue with two aspects of this post. I believe that when Francis likens illegal immigrants to Jesus, he is referring to the story of the Holy Family fleeing to Egypt for a time after being warned by the angel prior to the massacre of the innocents. I’m not saying I agree with the comparison. I don’t. I’m just letting you know what the reference is. Also, the Catholic Church as a whole didn’t elect him pope. The Cardinals did. It is not the same as a representative republic. They do not represent their “constituents.” We believe the Holy Spirit inspires their decision. I know that my family and I believe they misinterpreted the Holy Spirit this time. This is not the first time it has happened, and certainly won’t be the last. They are human after all. Yes, they fled to Egypt to escape Herod’s persecution. But no one refers to that when they actually were refugees because they didn’t stay in Egypt. They didn’t go there to convert anyone or to become Egyptian and no one knows how they were treated there so there is nothing on which to base their status. People always refer to their night in Bethlehem when they were seeking shelter and the Pope has said this, too. Also, I didn’t say the parishioners elected the Pope. I don’t know how you feel about Christianity and Catholicism. I became an atheist because of my Catholic church upbringing and only became Christian in the Southern Baptist church years later thanks to the people God put in my path. There I learned that half the people who attend church are not believers, but are there with family, friends, to network, and other reasons. But I have met some priests and heard bishops and cardinals who believe the old teachings that only those who are members of the Catholic church are going to Heaven rather than anyone who has faith in Christ. The whole reason I was lost is because I recognized at the age of twelve that they were all typical human beings and not holy saints. I’m just thankful God kept after me. According to Alberto Rivera, ex-jesuit (high level) Rome created Islam. According to the Protestant Reformers and what led to their split from Rome was the discovery that the seat of the Papacy is the power behind Antichrist. This discovery came after the invention of the printing press which allowed Bibles to be created much faster than Rome could find and burn them. The Bible exposes the Antichrist popes and states they are vessels of unclean spirits. All national leaders have given their power to the Papacy which means they obey his orders. It is the Vatican that promotes communism. Invasions of heathens across the borders of nation’s in biblical history was always a punishment for the people whoring after false god’s and following the laws of self. Catholicism is not Christian. It is a nation- state that wants to rule the world uniting all organized religions under the rule of Rome. The Jesuits are the secret assassins of Rome. 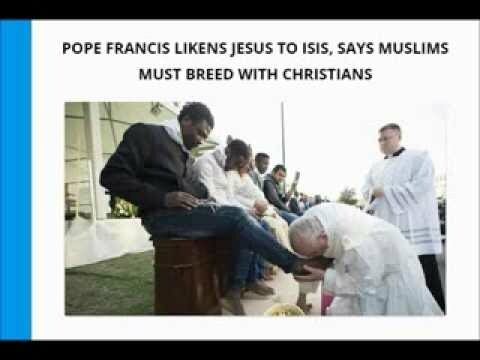 There is a black pope that Jesuits answer to, including Francis. The book of Romans, chapter one says all uncaught liars eventually become sodomites which means all sodomites are breakers of all Laws of heaven. The world has become Babylon. Repent and come out of her.